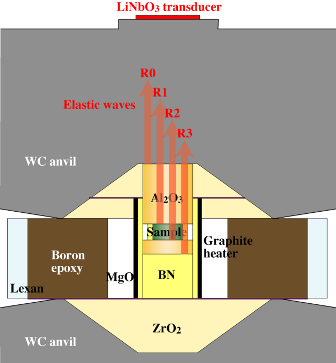 Ultrasonic elasticwave velocity measurement was developed by ultrasonic pulse echo overlap method combined with white x-ray radiography measurement (Kono et al., 2012, Review of Scientific Instruments, 83, 033905). Figure 1 shows an example of design of PE cell for ultrasonic measurement. A series of reflected elastic wave signals came from the interfaces of anvil/buffer rod (R0), buffer rod/sample (R1), sample/backing reflector (R2), and the back of backing reflector (R3) (Figs. 1 and 2). 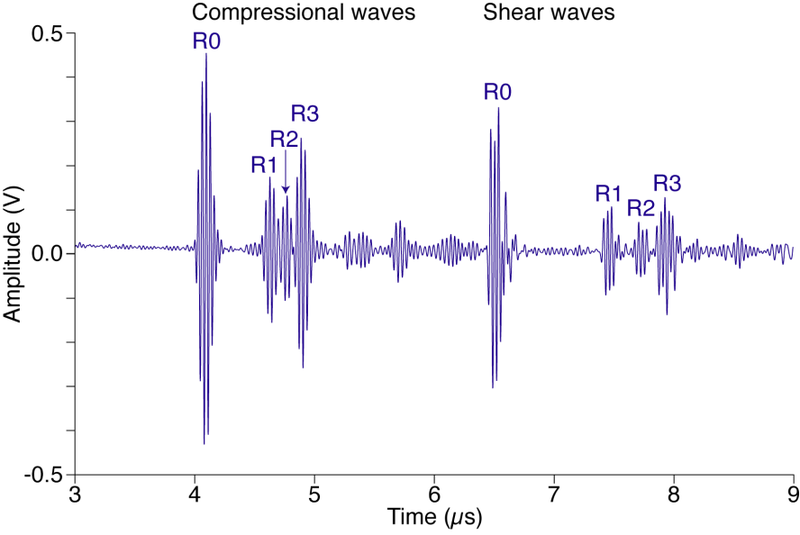 The elastic wave travel time through the sample can be determined by the pulse echo overlap method using the reflected signals from the buffer rod/sample (R1) and sample/backing reflector (R2) interfaces. Software to analyze the ultrasonic wave travel time is available at HPCAT.